After two flights and a ferry trip, I recently arrived at the northernmost part of Britain to unveil the plaque of the Confucius Classroom at Mid Yell Junior High School. As a result of this trip, I became the first foreign ambassador to visit the Shetland Islands and the first Chinese ambassador to land on Yell. While I am happy to have set those records, I was deeply impressed by the enthusiasm of the pupils from Mid Yell, aged 7 to 16, for the Chinese language and culture. Over 100 of them gave performances at the unveiling ceremony in Chinese! During my eight years as Ambassador to the UK, I have seen the number of Confucius Institutes and Classrooms grow from 11 and 47 to 29 and 156 respectively, more than any other country in Europe. Last year's enrolment totalled 160,000, and more than one million people participated in over 4,000 cultural events hosted by Confucius Institutes in this country. How to explain such enthusiasm in Britain? Firstly there is the immense appeal of the Chinese civilisation, whose vim and vigour is evident in the 5,000-year uninterrupted history of China. Learning the Chinese language gives one the "golden key" to unlock the door to understanding it . China's development "miracle" should also take credit. In the four decades since the beginning of reform and opening-up, China has grown to be the second largest economy in the world, lifted 700 million people out of poverty and has made a major contribution to global development. The Chinese language enables better understanding of the stories behind the "miracle" and greater benefit from the opportunities China has to offer. The third factor is the China-UK "Golden Era", launched during President Xi Jinping's successful state visit to the UK in 2015. The exchanges and cooperation between China and the UK in various fields have grown in quality and led to fruitful results. The Chinese language has been the "golden bond" of friendship between the peoples of the two countries. 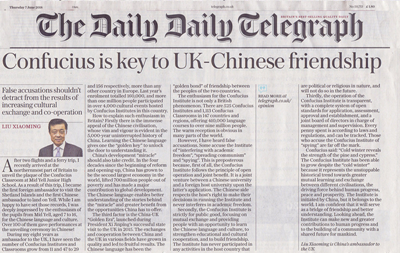 The enthusiasm for the Confucius Institute is not only a British phenomenon. There are 525 Confucius Institute and 1,113 Confucius Classrooms in 147 countries and regions, offering 410,000 language courses to over nine million people. The warm reception is obvious in many parts of the world. However, I have heard false accusations. Some accuse the Institute of "interfering with academic freedom", "spreading communism" and "spying". 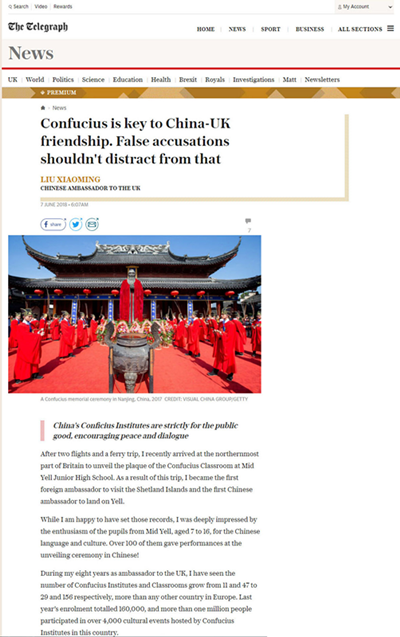 This is preposterous because, first of all, the Confucius Institute follows the principle of open operation and joint benefit. It is a joint venture between a Chinese university and a foreign host university upon the latter's application. The Chinese side respects the host's right to make their decision in running the Institute and never interferes in academic freedom. Second, the Confucius Institute is strictly for public good, focusing on mutual exchange and providing people with an opportunity to learn the Chinese language and culture, to strengthen educational and cultural cooperation, and to build friendship. The Institute has never participated in any activities in the host country that are political or religious in nature, and will not do so in the future. Third, the operation of the Confucius Institute is transparent, with a complete system of open standards for application, assessment, approval and establishment, and a joint board of directors in charge of management and supervision. Every penny spent is according to laws and regulations, and can be tracked. Those who accuse the Confucius Institute of "spying" are far off the mark. Confucius said: "Cold winter reveals the strength of the pine and cypress." The Confucius Institute has been able to grow despite the "cold winter" because it represents the unstoppable historical trend towards greater mutual learning and exchange between different civilisations, the driving force behind human progress, peace and prosperity. The Institute is initiated by China, but it belongs to the world. I am confident that it will serve as a bridge of friendship and better understanding. Looking ahead, the Institute can make new and greater contribution to human progress and to the building of a community with a shared future for mankind.